is a monotonic function that varies between when and when . 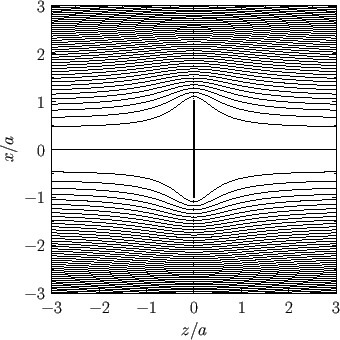 Figure: Contours of the Stokes stream function for the case of a disk of radius , lying in the - plane, and placed in a uniform, incompressible, irrotational flow directed parallel to the -axis. This flow pattern, which corresponds to that of a thin disk placed in a uniform flow perpendicular to its plane, is visualized in Figure 7.6.